St. Martin's Griffin, 9781250010759, 400pp. More musicians are recording, distributing, marketing, and selling their own music now than ever before in history. 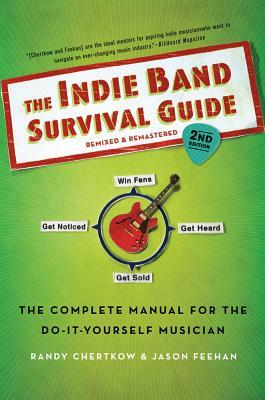 The Indie Band Survival Guide is the critically-acclaimed, do-it-yourself modern classic that has been telling them how for years. This information exists nowhere else. Chertkow and Feehan are pioneers in using the Internet to do what only labels could do in the past and will help your band go from garage to global. Randy Chertkow is an Information Technology specialist with over fourteen years of experience in enterprise-class Fortune 100 companies. He has a Bachelor's in Business Administration in Information Systems from University of Iowa and a Master's of Science in Computer Science: Data Communications, with a secondary concentration in Artificial Intelligence from DePaul University, where he graduated with distinction. Randy has played music all his life, including jazz, rock, and classical music. His instruments include baritone, tenor, alto, and soprano saxophones, flute, Bb and bass clarinet, guitar, bass, and anything else he can get his hands on. He started at the challenging New Trier High School Jazz program and went on to study jazz at Berklee College of music and then completed a Perfect Set course at the Bloom School of Jazz. He writes, records, and performs with Beatnik Turtle as well as performing with theater companies around Chicago. Jason Feehan is a practicing corporate attorney that works for a multinational executive search firm. He plays guitar and keyboards, sings, records, engineers, and produces. He founded Beatnik Turtle in 1997, growing it from a four-piece band into an eight-piece rock machine with a full horn section and a recording studio all its own. Unfettered by a formal music education, he often learned to play instruments as he wrote the music, and used nearly anyone in arms-length who could play or said they could play a musical instrument. He is a very prolific songwriter and has written close to a thousand songs, three of which are actually not too bad.